When I was little, my family and I lived in Melbourne, Australia, for 4.5 years. In our kitchen there was a shallow cabinet with lots of narrow shelves: a spice cabinet. My mom lined all her spices on the shelves... and my little sisters made it their mission in life to open up the cabinet, take one chubby little hand, and sweep all the spices off onto the floor. We have some really cute pictures of Emily and Julia doing this with oregano and cinnamon all over the floor around them. 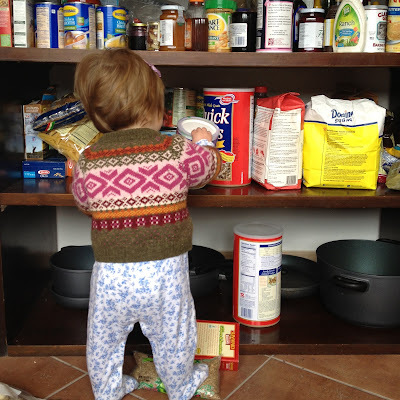 As soon as I saw the open cabinets in our house in Sicily, I knew Lena had hours of fun ahead of her. And I wasn't far wrong, as she figured out the game on our first day in our house. Since then taking food off my shelves has become a daily activity, and recently she's learned how to extract Triscuit crackers and Sun-Maid raisins from their respective boxes to get a snack in the middle of all her labors. As I toss (literally) all the bags, boxes, cans, and plastic bottles of food back into place several times each day, I try to take a brief second to enjoy this moment, this memory, this beautiful stage of her little life. Because pretty soon she'll know how to open the bag of sugar, the box of cous cous, the bottle of olive oil... and then where will I be?! You'll be at the NEX, buying a baby gate. Haha!! She's precious!